Digital transformation today is key to long term business success. Businesses have focused on increasing the level of agility in the area of applications, compute and storage, but in the past, Wide Area Network (WAN) has been ignored. SD-WAN (software-defined WAN) is considered one of the primary tools to industrialize the WAN, which is being fast considered as a core component for network and digital transformation. However, deploying SD-WAN has different challenges in terms of architecture, choice of broadband, security, application performance, use of proper edge devices, and choice of vendors to manage. Join this webinar to understand SD-WAN, its benefits and the future of fully-managed hybrid and SD-WAN solutions. Zeus Kerravala, Principal Analyst and Founder ZK Research and Peter Juffernholz, Associate Vice-President, Global Network Services, Tata Communications will discuss the link between SD-WAN and industry-specific challenges, such as Manufacturing, Services and Logistics and how they will overcome these. This webinar will share insights into overcoming challenges in SD-WAN and how to successfully serve new segments. There’s a lot to uncover and explore, making it a great opportunity to ask any questions you have around this area of connectivity. Join us to get a full picture of SD-WAN and how it’s going to accelerate Digital Transformation across the globe. Digital Collaboration technologies are emerging as the primary enabler of Digital Transformation within the enterprise. Today’s leading collaboration solutions connect users to the information they need the most – insight from other users, teams, partners, and customers. Further, a properly implemented Digital Collaboration solution serves as a platform that can extend the experience past the enterprise walls – integrating with internal and external systems, providing access to advanced AI solutions, and automating a wide range of enterprise workflows. When done right, these solutions serve as a foundational platform, driving enterprise-wide transformation. Join us as Bill Haskins, Senior Analyst and Partner at Wainhouse Research, and Paul McMillan, Head of Global Digital Workplace at Tata Communications discuss Digital Collaboration as an enabling platform, using data and insight gained from enterprises using their Digital Collaboration platform to transform key elements of their business. This is an interactive webinar, and you’ll have a chance to ask our presenters the questions that apply to your organization. All attendees will receive the presentation materials and a complimentary eBook exploring this topic in detail. GlobalData research reveals that around 70% of businesses have either deployed or are deploying SD-WAN technology. Businesses are moving more and more of their IT estate into cloud platforms which is the driver for SD-WAN adoption. Of course, this easily enables SD-branches for enterprises to make their businesses more agile and cost-effective. Join this webinar to understand the benefits and real-life experiences of end-users who have deployed hybrid WAN and SD-WAN services. Hear our speakers discuss the link between their analysis and the over-arching theme of enterprise digital transformation along with security, cloud, and applications. Get deep insights on how current enterprise WANs are transforming, and the drivers causing the change as we approach 2020. We will share insights from case-studies based on industrial applications of SD-WAN and hybrid VPNs across a handful of industry segments. From this webinar, you’ll get a clear picture of how you can transform your network through tactical migration to hybrid VPN and SD-WAN. · What should a fully managed hybrid/SD-WAN solution look like in 2020? Each year, Microsoft and Cisco take center stage at Enterprise Connect, delivering an avalanche of Unified Communications (UC) updates and announcements and this year will be no different! From Microsoft Teams to Cisco Spark, from enterprise Voice to the Broadsoft mashup – there are many messages to unpack. Join this webinar to understand Microsoft and Cisco’s key messages and current focus, balanced with a dose of enterprise reality. Bill Haskins, Wainhouse Research UC Analyst, will lead this lively discussion along with Tata Communications product leaders Chad Elford, Director of Cisco Powered UCaaS Solutions, and David Spears, Director of Microsoft Cloud Solutions. They’ll explore hybrid deployments, and a dual Microsoft and Cisco environment. There’s a lot to unpack on the state of play in UC - Microsoft Teams, Cisco Spark and everything from enterprise Voice to the Broadsoft mashup. Cisco and Microsoft are at the forefront of change that’s happening in the enterprise communications and collaboration space. The webinar will explore what each companies’ vision is for the future of UC. • What are Microsoft and Cisco Customers Asking for Right Now? • How do Hosting Partners Address the Challenges Associated with Hybrid Vendor Environments? Enterprises have a variety of choices when it comes to adopting new Unified Communications (UC) solutions. The current reality is that very few enterprises come close to unlocking the full potential of their UC platform to achieve the ideal experience. The UC landscape is evolving and the buying decision is becoming increasingly complex. IT teams need to constantly re-evaluate their strategy keeping in mind the numerous UC and UCaaS solutions, the end-user behavior, and growing expectations from the platform. In this webinar, Bill Haskins from Wainhouse Research provides his expert analysis of the current UC market. Bill discusses the pros and cons of leading enterprise UC solutions. Having observed the evolution of the UC industry closely, Bill covers key considerations for enterprise IT teams as they prepare their UC roadmaps for current and future needs. As most mid and large organizations have a considerable Cisco UC infrastructure footprint, Bill will also talk about Cisco’s approach to UC. Bill is joined by Chad Elford from Tata Communications who discusses the UC approach taken by many leading enterprises globally. Chad provides insights on business collaboration through UCaaS solutions and how it helps enterprises achieve their goals. If you are currently deciding the UC strategy for your organization or mid-way through executing one, this webinar will provide you with valuable intelligence to help you fine tune/pivot your UC roadmap for your organization’s digital transformation. Digital Transformation is changing user expectations. In our personal lives, we communicate and collaborate using a whole range of on-demand and flexible platforms and applications. The challenge is to meet user expectations and deliver communication and collaboration solutions that match or exceed what’s available in the consumer world. Legacy models limit how fast an enterprise can react and scale to meet new demand while making it difficult to adapt and change. Global Session Initiation Protocol can be a foundation for true business transformation and make it a reality within an enterprise. Businesses can unleash the power of SIP to create new user experiences while generating cost-savings and capturing new growth. Join Chris Barnard – IDC Vice President, Telecommunications and Networking, and Simon Farr – Product Marketing Director, Business Collaboration, Tata Communications in a live webinar. Chris and Simon will explore the potential of SIP and how it can act as a foundation for Digital Transformation. Many enterprises are currently on a trajectory for virtualizing their network services. There is a clear evolution path emerging - one that is taking customers from their legacy IP and Ethernet VPNs towards Hybrid VPNs - whereby the Internet is increasingly taking traffic loads and must be business-grade, and then towards SDN/NFV. The next phase of the customer WAN journey is already underway for many enterprises. SD-WAN services are now available from a large variety of suppliers including telcos, systems integrators, platform developers, hardware vendors, cloud providers and software developers. The SD-WAN term has become a huge buzzword gleefully bandied about by many in technology, but what are the real underlying issues that enterprises must consider? How can enterprises guarantee a consistent customer experience for application and network performance across the distributed WAN locations? 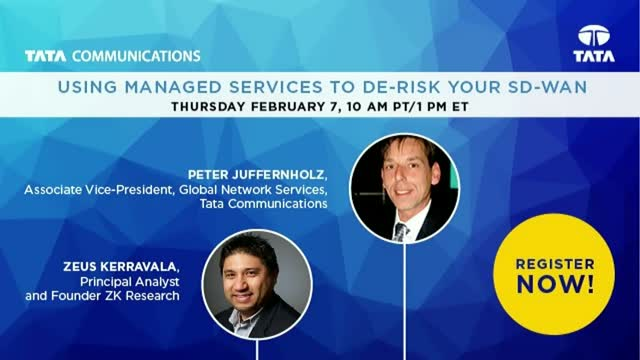 Join Joel Stradling - Global Data’s Research Director for Global Managed and Hosted IT Services, and Peter Juffernholz – Senior Network Executive from Tata Communications in a live webinar. Joel and Peter will examine the SD-WAN transformation customer journey to provide insights about what might be the right fit for your enterprise and to de-bunk marketing myths. -How do you determine which SD-WAN model is right for your enterprise? Tata Communications is a leading provider of a New World of Communications™ to global enterprises and service providers. The Tata Communications Global Network, the world’s largest, reaches more than 240 countries and territories. Our service offering includes a comprehensive selection of networking services which can be combined with our Unified Communications, Mobility, Cloud, and Security services to deliver end-to-end connectivity solutions for your business. We deliver an agile communications and collaboration architecture that supports both legacy and next generation services. Our services are purpose built to help your business transform effectively. This transformation will allow companies to offer a better internal and external customer experience, mitigate business risk, and expand into new geographies through borderless growth.